We are providing wide rage of Electronic Counters such as digital counters, digital preset counters and Digital Event Counter. These Counters are energy efficient having excellent counting speed and rated frequency. We offer our clients a wide range of event counter model H3CT – 5, which is developed after extensive market research. These digital counters are available in different rated supply voltage and frequency as per the application requirements of our clients. Further, the counters can also be customized as per the specifications given by our clients at industry leading prices. Function: up counter with hold mode. 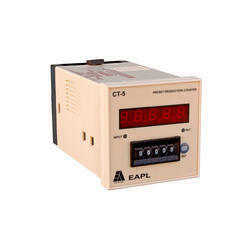 The wide range of Preset Counter CT 5 offered by us is available in 240V AC and 110V AC models. 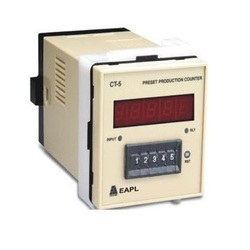 These digital preset counters have counting speed up to 100 Hz maximum and equipped with LED indication for providing input signal and relay status. Further, the excellent battery backup ensures optimum performance and long working life of the unit. Our organization is involved in manufacturing and exporting a quality range of digital event counters Model H3CT. 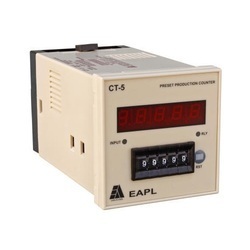 These digital event counters are energy efficient having excellent counting speed and rated frequency. The function up counter is provided with a hold mode to ensure easy operation. Looking for Electronic Counters ?